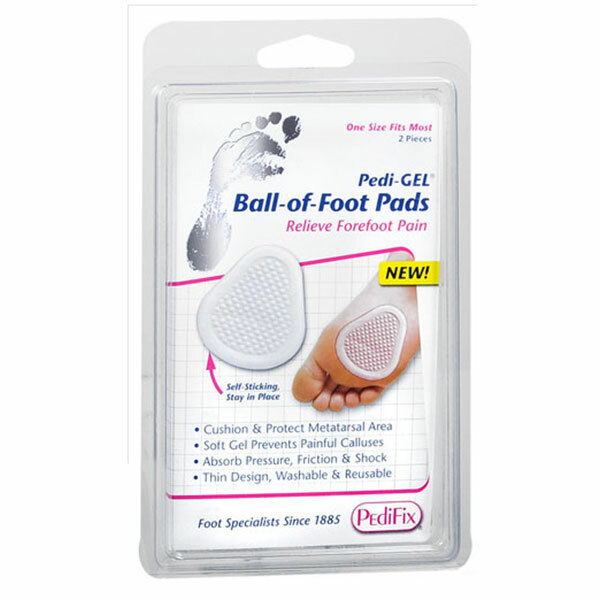 PediFix PediGel Ball Of Foot Pads One Size Fits Most Pair is a specialty foot care product by the makers of Pedifix. Pedifix has been a trusted name in foot health products for more than 100 years. The Pedi-GEL Ball-of-Foot Pads were designed to relieve pain, prevent calluses and keep feet from sliding forward in shoes. The extra padding makes thin-soled footwear more comfortable allowing you to look fabulous without sacrificing comfort. Cushions and protects metatarsal area. Soft Gel prevents painful calluses. Absorbs pressure, friction and shock. Thin design, washable and reusable. Self-sticking and stays in place. Contains a pair of PediGel Ball-of-Foot Pads - One Size Fits Most. Directions: Wash and dry feet. Peel off backing and apply. To Remove, gently peel away from skin. Do not apply lotions, powders or medications to pads or skin when using pedi-GEL products. Keep packaging for storage when not in use. Pads will not adhere to skin unless both skin and shoe are clean and dry. Washing Instructions: Hand was. Air dry completely before reuse. Gel maintains its self-adhesive properties even after washing. Warning: If you have diabetes, consult your doctor before using. Do not place product on an open wound. IF irritation, discomfort or poor circulation occurs, discontinue use. If symptoms persist, visit a foot specialist.